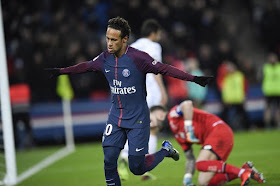 Paris Saint-Germain pays 12 of the 13 largest player salaries in the French league, led by Neymar, who makes 3.07 million euros ($3.8 million) gross a month, more than twice as much as the next highest earner, sports daily L’Equipe reported on Tuesday. Behind Neymar, PSG players occupy the next seven places: Uruguayan Edinson Cavani makes 1.54 million euros a month, French teenager Kylian Mbappe earns 1.5m euros and Brazilian defender Thiago Silva makes 1.33m euros. Then come Argentine midfielder Angel Di Maria and Brazilian defender Marquinhos, both on 1.12m euros, Italian midfielder Thiago Motta (875,000 euros) and Argentine Javier Pastore (770,000 euros). The first non-Parisian on the list is Radamel Falcao, the Colombian striker who earns 750,000 euros a month and, because he is in Monaco, pays no taxes. The top ten is rounded out by Dani Alves, another Brazilian defender at PSG, who makes 700,000 euros. Next come three more PSG stars — German striker Julian Draxler and Italian playmaker Marco Verratti both make 600,000. PSG’s French striker Hatem Ben Arfa is tied on 500,000 euros a month with two Marseille players, the former West Ham player Dimitri Payet and Brazilian Luiz Gustavo. At the other end of the Ligue 1 salary table are Amiens, where the average monthly salary is 15,000 euros, including three players on just 2,800 euros. Since the sacking of the Marcelo Bielsa, who was making 560,000 euros a month to coach Lille before he stormed out, PSG’s Unai Emery has become the highest earning manager on 450,000 euros a month. Next comes another man working tax-free in Monaco, Leonardo Jardim, on 350,000 closely followed by Claudio Ranieri, who won the English Premier League with Leicester in 2016 and makes 340,000 a month in Nantes.